Last week our weather was a little cool. Well, relatively speaking. Several days were overcast and drizzly all day long, more Seattle-looking than our usually rainy season weather which owes more to Midwestern summer thunderstorms than anything else. 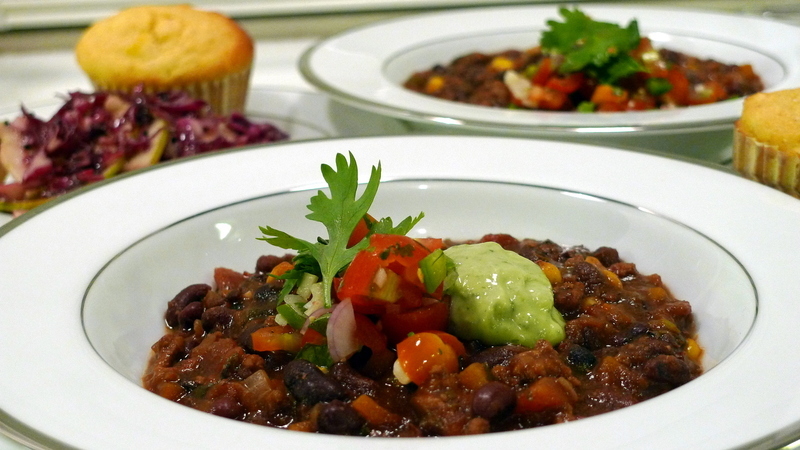 It seemed an appropriate time to cook some warm, hearty comfort food, so I dug up a recipe for Mexican Black Bean Chili and made it in a Monday night meal along with some buttermilk cornbread muffins and a tasty red cabbage and apple slaw. Beans are super-healthy, incredibly inexpensive, and easy to use. Make a large batch and freeze up the extras so you can thaw them out and make a fast and easy weeknight dinner like this one. This chili uses chopped onions and peppers (I added some carrots, too, as I had some on hand), and plenty of cumin, lime juice, chopped cilantro, and dried chipotle pepper to add a nice kick. One thing I add that isn’t in the recipe is a few tablespoons of cornmeal. I add then to the aromatics as they are sauteeing in a little bit of oil. This creates a roux that thickens the chili and adds a nice flavor, too. To garnish, I used a little leftover homemade salsa and avocado cilantro lime cream sauce from fish tacos a few nights earlier. The slaw is a nice alternative to the usual green cabbage slaw. Not only does this offer more vitamins, it also has more flavor. The recipe is based loosely on the one from Blue Smoke BBQ but I play around with it. For starters, I leave the peel on the apples (more fiber and flavor) and slice them thin instead of chunks, which adds more visual interest to the dish. Additionally, I play around with their dressing recipe, reducing the mayonnaise, using apple cider vinegar for their white balsamic, leaving out the chilies, and adding some nigella seed. Sitting alongside a cornbread muffin, I think it is quite pretty. The combination makes for a very tasty and very healthful meal. To top it off, chili is one of those dishes that benefits from a night or two in the refrigerator, so it made even nicer leftovers later in the week! This entry was posted in Uncategorized and tagged Beans, Black Beans, Chili, Coleslaw, cooking, food, Slaw by christao408. Bookmark the permalink. Apart from the mouthwatering dish, I have been meaning to compliment you on the very decent and elegant dishes you have. This one looks easy enough (and so good for rainy Vancouver days) that I think I might surprise hubby with it! How do you and Tawn maintain such great waistlines considering what foodies you guys are! Now I am regreting that I didn’t bought the canned black beans the last time I went to Finga’s (last blog). I’ve been craving for it for quite some time already, and here comes your blog. It looks so delicious! Looks lovely – but sadly I don’t eat chilli or beans. I might try the slaw. Nigella seed… I keep thinking of Nigella Lawson. I have a hunch you’ve moved your work armoire to the kitchen. How else could you multitask so effectively? 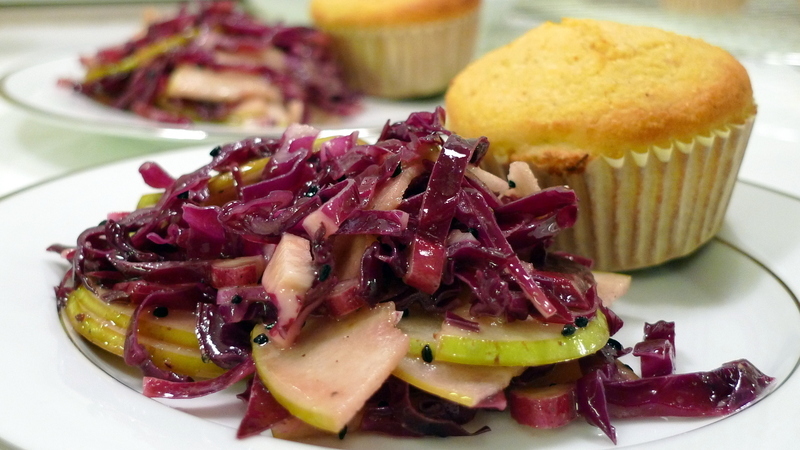 Love the look of the purple cabbage and apple slaw. We just polished off the last of the chili. My husband likes to “doctor” his. He makes it so hot! I’m sometimes afraid he is going to do himself an injury. Yes, there is such a thing as too hot! Looks geat as usual. I am a chili lover during the cooler months here. There is something not right about the color of the chili. A slightly orange hue that does not contrast well with the brown/black of the beans and meat. OMG I am so sorry … it looks sickly. You reliably make me hungry at the most inopportune times. 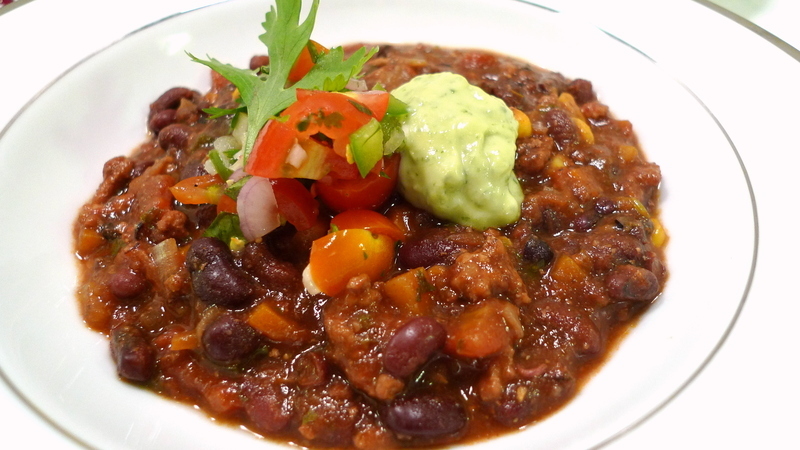 What is the green colour paste topping the bean chili? Guacamole? @amygwen – Compare the first and last shots and you’ll see the color is different. The first shot isn’t color corrected quite right as it did pick up more of a yellow hue. Was also steamy when I shot, so may also have some reflection of the overhead lights, which have a yellow cast. @Finity – Should I schedule the postings for a more convenient time? =D@CurryPuffy – Leftover avocado-cilantro-lime-cream sauce from the fish tacos a few nights earlier. @beowulf222 – Oh, the plates and bowls? Thank you. They’re actually a very inexpensive local line but they have a nice simple design. @lil_squirrel4ever – We try to avoid showing our waistlines in pictures so that we can keep up the mirage of thinness. =D@icapillas – Let’s hear it for black beans! @Umnenga – Hmmm… no beans, no chili… I guess the slaw is all you’re left with! @ElusiveWords – Excuse to get up and stretch my legs. @murisopsis – Does he use tabasco or something else to doctor it? @Fatcat723 – It really is wonderful during the cooler months. I saw black beans~ and had to stop by. So glad I did. I love trying new chili recipes~ but sadly, with five teens still living at home, there are never any leftovers. The avocado cream sauce looks heavenly.Thank you! @WildWomanOfTheWest – Thank you for stopping by. Teenagers don’t allow for leftovers, nor the opportunity to let the chili rest for a day before serving. Such a shame! @Ms_Fat_Pinkie – Ha ha… my evil plan of spreading hunger has worked! just want the Chili at this odd hour in YVR after seeing your pics…..
@agmhkg – My plan has worked! @murisopsis – Goodness. When are y’al coming to Thailand? We’ll see if he can really stand the Scoville units. My daughter in law is a vegetarian. I am going to let her read this and see if she woud like to try it. I think I will make it any way, and see what she says. Thanks Chris. Chili’s perfect for fall weather! @ZSA_MD – Well, the chili has meat in it so it isn’t vegetarian. Although you could just add more beans and forget the meat, I suppose. @yang1815 – Yes… now all we need is some Fall weather! @ZSA_MD – @christao408 – Trust me vegetarian chili can be very very good. Take out the meat and put in another kind of bean, or two!I almost won a chili cook-off last year with the only vegetarian entry among many other meat ones.